In a recent article, the New York Times published an AP report that Motel 6 has agreed to pay $250,000 to settle a human trafficking lawsuit in Los Angeles. The suit, brought by Los Angeles against a Motel 6 property’s managers and G6 Hospitality Property LLC., which operates all Motel 6 properties, centered around allegations that human traffickers, drug dealers, and gang members were operating out of a Motel 6 property in L.A.’s Sylmar neighborhood. Los Angeles police had made more than 60 arrests for prostitution, battery, firearms possession and drug related charges at the property since 2013, according to the article. The report lists instances cited in the lawsuit when undercover police officers collected evidence of criminal activities at the property, such as an instance when hotel staff “didn’t hesitate” to rent a room to an undercover officer posing as a pimp, who told the workers he intended for another undercover officer to work as a prostitute there. The money from the settlement will be used to deter human trafficking, according to Los Angeles City Attorney Mike Feuer. "Our settlement commits Motel 6 to comprehensive, concrete action that's focused on security at the site and strong management at the site," Feuer said. The motel will require valid photo identification from guests, hire security guards, and post signs in the lobby about human trafficking as part of the settlement, according to the article. For a full list of safety measures a hotel can take to prevent and respond to human trafficking and child exploitation, check out ECPAT-USA’s Hotel Safety Checklist. Los Angeles police will also have access to the motel’s guest list and visitor logs, and the motel will also give officers access to remotely monitor the motel's security cameras. Anti-trafficking training for hotel associates can prevent situations like this, and must be a part of the response to cases of human trafficking in hotel and motel properties. 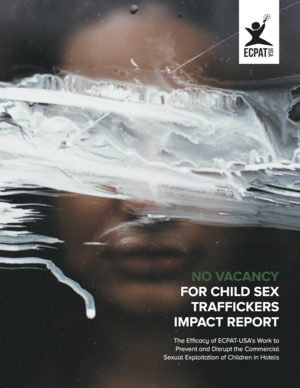 Since 2004, ECPAT-USA has worked with hotel brands around the United States to train associates to recognize and appropriately respond to suspected instances of trafficking. Training not only helps to stop traffickers and protect victims; it also protects hotels from the kind of liability Motel 6 is dealing with. Learn more about training for hotels, and what travellers can do to encourage hotels to provide training on ECPAT-USA’s Responsible Traveler page.